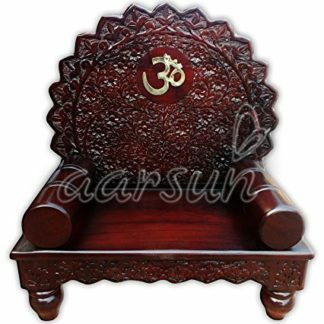 Aarsun Woods offers you this handmade Wooden Pooja Chowki / Singhasan made in premium quality Sheesham Wood (Indian Rosewood) with beautiful Wooden Carving at the back and pillow shaped sides carved out in traditional carving and finishing with Om in front. The Pooja chowki is made by skilled artisans from Saharanpur. Customization also available. Contact us via Amazon Messaging and we will provide you the unit exactly as per your requirement and too delivered right at your doorstep. Rosewood is comes into different shades like from golden brown to deep brown in color and have dark streaks which give them very attractive look and appearance. 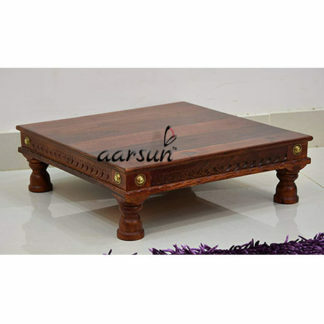 The wood is hard and has medium coarse texture making it is the best wood for carving and engraving purpose. Rose wood is of very unique color and gives very fine finish after hand waxing. Rosewood is perfect for creating antique furniture for homes and for offices as it gives a very smooth finish to the product.